MOBILedit! for Windows XP - a program to synchronize data on a smartphone with the ability to transfer settings to another device. The phone manager allows you to manage a list of contacts, messages and multimedia files, allows you to make backup copies, store data on cloud services. The application supports wireless connection interfaces, can interact with sim readers, includes a photo editor and ringtones, a function for transferring parameters to a new smartphone. The utility is able to work with all versions of mobile OS, can be used as an Internet gateway. 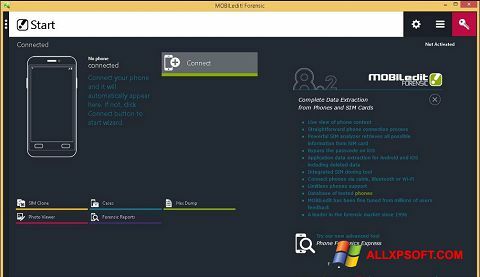 You can free download MOBILedit! official latest version for Windows XP in English.